Writing a bio about yourself without it reading like an obituary (‘cause that’s what you really wanted, right?) feels uncomfortable because it’s like boasting when you’re taught to be humble. There is nothing wrong with highlighting the good stuff about your life and business. 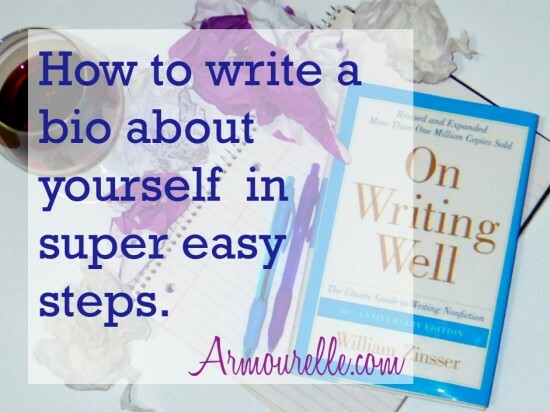 With a little know how and the steps below, you can write a bio about yourself that makes you swoon. Write a list of your accomplishments. Now that you’ve got your ideas down, it’s time to think about your audience. What items on your biography accomplishment list would appeal to them? For example, if you’re writing for an Etsy shop, choose experiences from your list validating your crafting experience. If you’re writing a speaker’s bio, mention your “Big Idea” and select experiences showing that aspect of your work. Choose things that will excite the person reading your bio. Make them want to learn more about you. Write with a formula and a goal. Lead with either your most recent success, OR with an activity you’re known for doing. Follow up with evidence supporting your success and/or expertise. End with where people can find you, physically or online. Consider your tone while writing. Your bio should be straight-forward, sans the garnish of flowery language. It should frame you in a positive way, allowing you to confidently share more about yourself through your bio. Don’t make your life-in-five-sentences sound like you watch TV all day, but don’t over-inflate yourself either. Be like a male peacock: flashy, but with a purpose. This is when you should think about the end goal for your bio. What do you want people to think or do after they read it? Do you want to bring people back to your website? Do you want folks to join your movement? Don’t be afraid to ask the reader to take action. While there isn’t a standard length for bios, it’s best to keep to a few paragraphs, or shorter. Your audience isn’t Ricky Ricardo, so there’s no long-winded ‘Splainin’ you’ve got to do. Keeping your bio trimmed to a few short paragraphs ensures that only the most important and interesting facts make it in. No one wants to read a bio that is 3500 words unless you’re Oprah. When editing your bio, think like a fashionista: remove an accessory before leaving the house. Don’t be afraid to slice it and dice it a little. These tips will help you write a bio about yourself even if you don’t think you have anything interesting to write. 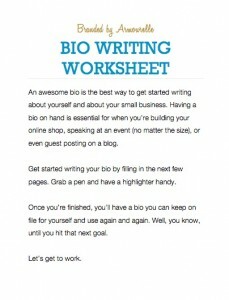 Download my free bio writing worksheet if you want a step-by-step guide. Remember allow yourself the comfort to write with conviction about your accomplishments in a positive way. And for most of us, that feels unnatural—like we’re trying to be cute when we think we should just go “saddown somewhere.” Ignore that reaction and enjoy writing a bio about yourself. “Give yourself permission to write about yourself, and have a good time doing it.” –William Zinsser, On Writing Well.